Posted August 20, 2014 by The Rapid & filed under Silver Line. With the new feature of pre-paid boarding on the Silver Line, we understand that their may still be some lingering questions about payment for riding this new route. We’ve compiled a list of frequently asked questions to walk you through a number of payment situations that you may encounter while riding the Silver Line. It’s also important to note that along with the opening of the Silver Line on August 25, our fare structure will be undergoing some changes. 1. 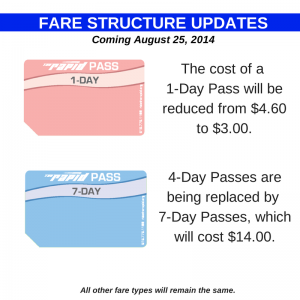 How is the fare structure changing on August 25? Four-Day Passes are being replaced with 7-Day Passes, which will cost $14. The cost for 1-Day Passes will be reduced from $4.60 to $3.00. We are also transitioning our passes to a new, sturdier ticket stock to ensure compatibility with ticket vending machines. 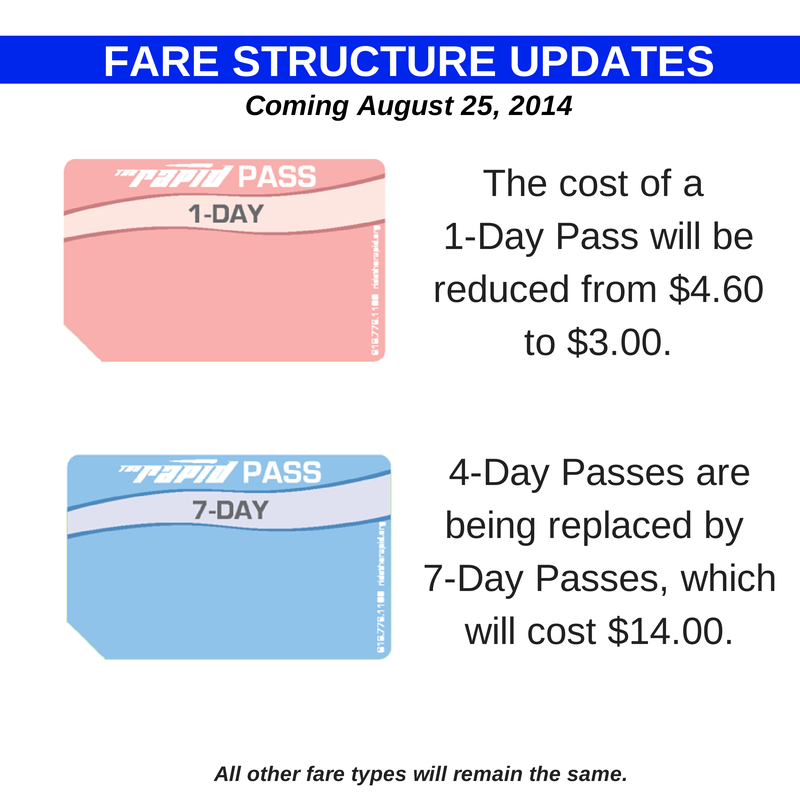 There are no other fare changes taking place. 2. Where can I buy tickets? All current ways to purchase tickets will still be available. While all ticket types except for 4-Day Passes will also be available for purchase. Ticket vending machines (TVMs) will have 1-Trip, 1-Day, 7-Day, and 31-Day Passes available for purchase. 3. Will old passes, those featuring the new design and sturdier ticket stock, still be valid? All old ticket stock, even those no longer sold, will still be usable on the buses and at the ticket vending machines. However, TVMs are unable to print on old ticket stock showing how many rides/how much time is remaining. The tickets can be inserted in the TVMs or validators to determine this information. All new tickets will be printed on by the fareboxes and TVMs, but the printing will be on opposite sides of the ticket: TVMs will print on the front of the ticket, while bus fareboxes will print on the magnetic stripe side of the ticket. 4. How do I use a 1-ride, 2-ride or 10-ride tickets on the Silver Line? Simply validate the ticket before boarding. This can be done by using the ticket vending machine (TVM) or validator, but preferably the validator as this takes less time and does not tie up the TVM for those interested in making purchases. 5. How do I use a 1-Day, 7-Day or 31-Day period pass on the Silver Line? When riding the Silver Line, you must have a valid period pass. If it’s a new pass, it must be validated before boarding. If the pass has already been validated, simply board. You can use the TVM or validator to validate the period pass or check it’s status. You only need to validate a period pass once, as it will be considered valid until expiration. Be sure to always carry your period pass with you while riding the Silver Line. 6. How do I transfer from another bus to the Silver Line? Have your valid transfer on hand when boarding the Silver Line. You can insert the transfer into the validator to see if it is still valid. When asked to provide proof of fare payment on the Silver Line, show your valid transfer ticket. Transfers must be valid at the time you board the Silver Line. 7. How do I transfer from the Silver Line to another route using a cash fare? The one-ride ticket you purchased at the TVM acts as a regular transfer – use the ticket to make up to two transfers in the next 2 hours. 8. How do I transfer from the Silver Line to another route using 1-ride, 2-ride or 10-ride pass? g the Silver Line validation within the past two hours to the driver and they will permit you to board. 9. What if I am boarding the Silver Line with an old ticket stock 1-Ride, 2-Ride or 10-Ride pass? The TVMs and validators will not print onto old ticket stock. Therefore, someone possessing an old pass with valid trips available will be allowed to travel on the Silver Line. While fare enforcement officers will have no way to confirm whether a ride was deducted, the pass will still be honored. We will be moving to new card stock as rapidly as possible. 10. What if I want to transfer from the Silver Line to another route using an old ticket stock 1-ride, 2-ride or 10-ride pass? The only way for our drivers to know there is a valid fare on a ride ticket when transferring from the Silver Line to a regular fixed-route bus is the printing on the ticket showing a ride was taken on the Silver Line. However, the TVMs and validators will not print on the old tickets so there will be no way to show there was a valid fare taken off on the Silver Line allowing for a free transfer. Therefore, someone using an old pass and transferring from the Silver Line to another fixed route bus will have to purchase a new ride (ex. have one more ride deducted from their 10-ride ticket). 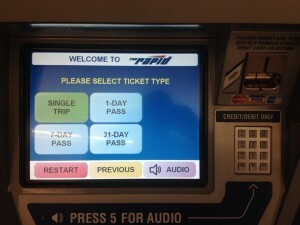 This will not be an issue for new tickets where the ride on Silver Line will be printed using the TVMs or validators. 11. How do riders from Kendall, Spectrum and GVSU access the Silver Line? Kendall and Spectrum employees must carry a valid Kendall or Spectrum ticket while riding the Silver Line. GVSU students must carry a valid GVSU student ID while aboard the Silver Line. 12. How do Calvin and Aquinas students access the Silver Line? Calvin and Aquinas students can purchase tickets for full price at the Silver Line TVMs or purchase a book of 10-student tickets for $9.00, similar to other students. You can also find these frequently asked questions on our website.